Before playing each of the memory card games (skunk, snake, bear, penguins, unicorn, zebra) print off the corresponding worksheet and show your child the 30 words listed. Check off any words that your child recognizes in the "Pre" column. After completing all card sets of the memory card game, show your child the list again, and check off the words recognized in the "Post" Column. After playing card sets 1 & 2 of each of the memory card games (skunk, snake, bear, penguins, unicorn, zebra) see if the student can read the short test sentences comprising the ten words they have learned through game play on the corresponding flashcard. Repeat this process after completing memory card sets 3 & 4 and again after sets 5 & 6 for each of the six decks. This step helps the child transition from reading stand-alone words to reading a whole sentence, ensuring success when they eventually get to the corresponding storybook. This class recording sheet will help keep track of each of your students' progress through the test-sentence flashcards. The Reading Game is a supplemental resource that complements most standard curriculums and meets the criteria of the Common Core Standards for Language and Literacy Arts in four skill sets: Foundational Skills, Language, Speaking and Listening, and Reading. 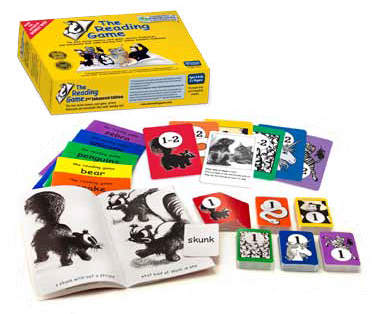 The staged learning format of The Reading Game first introduces individual words through game play in a fast-action memory card game. Each memory card game contains thirty words, taught in manageable five word segments. When used in classrooms, parent volunteers or older "reading buddies" can work with the student or in small groups to play the matching card game. Frequent exposure through play hard-wires these words into long-term memory. After learning ten words through game play, the student is shown a captioned picture flashcard. This flashcards turns the ten words just learned into short descriptive phrases and sentences, which reinforces the words learned through game play, transitions the student from stand alone words to a sentence format, and introduces the use of capitalization and punctuation. After completing stage six of the first game, the student has a reading vocabulary of thirty words. The first story is told using just those thirty words. It tells of a skunk without a stripe who is rejected for being different but finds acceptance among a group of cats and becomes their defender. Each subsequent game in the series adds a further thirty words for a reading vocabulary of 180 words by the time the complete series is finished. Of the twenty-five most commonly used English words, twenty-two are on that list; of the forty most commonly used English words –thirty. The multi-sensory teaching approach – through the card game play, flashcards, and the storybooks - works well for retention and student enjoyment. By the time students come to the end of the Zebra story, 180 words are hard-wired into memory. Phonics can then be incorporated into the game by using the cards to develop links to similar words and sounds (see notes on Phonics in the Rules and Teachers Guide ). The brain is now perfectly capable of going it alone; new words as they are encountered will go into long-term memory because that part of the brain is now primed for such a task. Millions of neurons are geared up to go to work. All you have to do is feed the student books. The Reading Game is intensely rewarding; you are giving the gift of literacy. Free Individual Student Assessment and Class Recording Worksheets include the Pre/Post Card Game Sight Word Assessment Worksheets which enables you to assess each student’s sight word recognition BEFORE and AFTER playing each of the six card games. There is a Pre/Post Sight Word Class Recording Sheet to keep track of each student's progress. At the back of the Teacher and Parent Guide, which comes with each game, is a listing of all 180-vocabulary words, which can also be used for pre and post sight word assessment if more expansive summative testing material is desired. A second recording sheet, the Flashcards-Test Sentence Class Recording Sheet will help you keep track of all your students' progress through the various stages of each game. Collecting and reporting data on how students are progressing is increasingly important. Many school districts nationwide have adopted or will be adopting evidence-based learning practices and most states have embraced the common core standards. Using the pre-game sight word assessment worksheets to establish the student’s individual sight word knowledge before they start the series and the post-game sight word worksheet after the student finishes each card game/book for each of the six in the series will allow you to make an evidence based summative assessment and show measurable results for each student in your care and your classroom as a whole. • Dolch Word List of “service words” (pronouns, adjectives, adverbs, prepositions, conjunctions, and verbs) that cannot be learned through the use of pictures. 60% of the words in “The Reading Game” are on the Dolch Word List for pre-k and k and makes up 54% of dolch words for Pre-K, K and 1st Grade. • Of the first 100 most commonly used English words (source The Reading Teachers Book of Lists, Third Edition by Fry, et al) “The Reading Game” incorporates 88% of the most common twenty-five words and 63% of the first 100. The Reading Game is proud to be supported by "The Education Freedom Coalition." The Reading Game was not purposefully designed or aligned to Common Core, but by the very nature of the basic sight-word teachings, it happens to meet many of the basic Common Core educational objectives." Measurable: Pre and post card game sight word and test sentence assessments are available along with class recording sheets that allow for formative and summative assessments and evidence based measurement for reading vocabulary development at the individual and class levels. Rigorous: The fast action card game hard wires words into the student’s long-term memory. Each game/book builds on the previous set’s reading vocabulary. A Clear Goal: To develop a reading vocabulary in a manner which students find fun and familiar, giving them the tools to read the accompanying books which are content rich and engaging. “The Reading Game” makes learning to read fun and builds reading confidence. For a full listing of standards and how The Reading Game correlates to them, click here.